euroCARE IVF is widely recognized as one of the top fertility clinics in Cyprus. Over the years, we have built an international reputation on an impressive list of achievements in the field of reproductive medicine. Since opening, euroCARE IVF is honored to become a patient favorite and one of the most successful fertility centers in Cyprus. euroCARE IVF provides exceptional medical expertise and unwavering support to help you realize your dream of parenthood. We pride ourselves on the achievements of our medical team and their successes in the field of reproductive medicine. 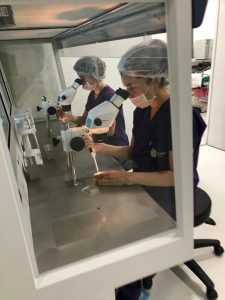 Our high performance team of qualified fertility specialists, experienced embryologists, excellent researchers, compassionate nurses and support staff will provide you with a holistic approach to treating your infertility condition. The balance of expertise and emotional support is the key to our success. Dr. Armağan Ulubaş is a highly qualified fertility doctor with over 25 years of experience in the field of reproductive medicine. For more than two decades, Dr. Ulubaş has worked in various fertility clinics around the globe where he has developed extensive medical expertise and prowess. Dr. Ulubaş’s professional bio is as impressive as his everlasting passion to help and serve people around the world. What makes euroCARE IVF unique is customized fertility care for our patients. Our personalized treatment plans are specifically designed to address your medical condition and fit your personal needs. euroCARE IVF is the only fertility destination where ground-breaking research is quickly translated into new IVF treatments — providing you and your family with access to the the life-changing fertility care that offers an alternative and renewed hope for your infertility struggle. We work hard to deliver happiness and joy to individuals and couples from around the world. Our vision is to create better possibilities for individuals struggling with infertility to realize their dream of parenthood. Our mission is to make sure that people receive the best fertility services at a reasonable price. Expertise – We possess expert knowledge and unparalleled medical experience in the field of reproductive medicine and infertility. Our high performance team comprising of highly qualified fertility experts, experienced embryologists and friendly patient coordinators will provide you with expertise and support throughout your journey. Empathy – We deeply empathize with our patients and are fully committed to helping them get the best fertility treatment tailored to their medical conditions and personal needs. We make our fertility services widely accessible and affordable for everyone wishing to build a family. Accuracy – All research and tests are performed with the highest precision in our state-of-the-art laboratory. The groundbreaking technology we use ensures that all test results are 100% accurate. Honesty – We are 100% honest with our patients about their chances for positive outcome. If we think a patient might benefit from a certain fertility treatment, then we make sure they get the best suiting, personalized treatment plan for their infertility problem. Modern clinic boasting state-of-the-art equipment, advanced IVF procedures, and the leading IVF specialists in North Cyprus.